We all have a style, you may already know what yours is or perhaps you are looking to update to a new one, or it may be lost at the moment but it’s there I promise you. It doesn’t have to be like pulling teeth figuring it out and trying to find it. You may also be like me who swears I don’t have one “I’m Eclectic”. 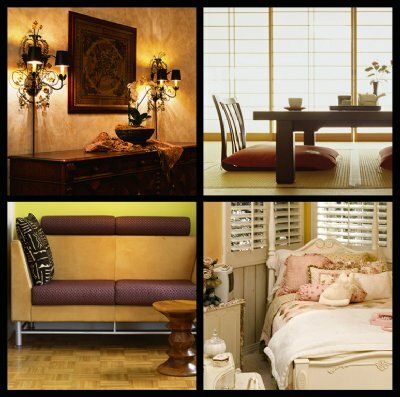 I like a combination or mix of styles which I encourage clients to strive for when decorating their homes. Why? Because my personal design philosophy is that the home should be a reflection of the client’s personality, taste, style, and their likes and so on. I don’t believe in branding someone’s home to reflect that of the designer. For ourselves, we wanted our guests of course to feel welcomed into our home but also to get a sense of feel for our personalities, to reflect our likes, incorporate pieces from our travels, photos of our family, displays of treasured collectibles, antique furnishings handed down through the generations and so forth. It’s a reflection of our lives arranged and coordinated in an eclectic traditional style all our own. How we did it successfully was by analyzing ourselves and discovering that our primary style base was traditional. By using the rudiments of the traditional style it kept us grounded through the process, when picking colors, deciding on furniture, selecting cabinets, countertops, flooring and so forth. So where to begin? Well we all know what we like and don’t like. So to begin the process, I have people start looking through an array of magazines at first that present a variety of styles in their issues…such as Architectural Digest, Home and Garden and the like. Start flipping and ripping out those pages with the items, images of rooms and so forth they like. Don’t think just rip even if its only one item in the image, for example an accessory item, a window treatment, the colors of the room, what ever it may be. Now make a notation on it as to what it was that drew your attention, or attracted you to it. If you don’t know that’s ok, but know you like it, even better…just note that on there. The process is fun and often surprising. When you have had enough with that and have a nice collection, take a break, you’ve earned it! Now there are literally hundreds of styles however they all come back and fall into three of the basic and most popular primary thematic categories: Traditional - Casual/Contemporary - and Country Style. Use these three when you go through your selections from the magazines, organize them based on the descriptions provided for these 3 categories below. Before you know it you will see your pattern emerge and fall right into discovering your primary style. Traditional Style Themes are trademarked with more formality, a sense of timelessness, tried and true elements, ornate designs and dark colors. The use of rich fabrics with patterns like damasks; jewel tone colors such as royal and navy blues, emerald greens, and burgundies. Furnishings, moldings and woodwork are typically in cherry woods; consist of ornate detailing, dark stains, leather, polished brass and gold. Casual / Contemporary Style Themes are the most popular of the 3 themes today with clean simple lines, geometric shapes, and neutral color pallets of whites, grays, and beiges along with furnishings in light woods such as Maple with natural and light stains. Pottery Barn, West Elm type items, and designer styles like Jonathan Adler. Country Style Themes of today are very stylish, giving you a warm cozy comfortable feel, using sturdy furnishings of pine woods with an antiqued distressed or crackled look, using both a bright as well soft color palette mixing bright reds, blues and lime greens with softer earthy tones, pastels. These are warm and comfortable room settings, that read “don’t be afraid to put your feet up” type of feel. It’s simple and fun and when you continue to research your primary style category you’ll begin to discover their numerous secondary styles. Repeat the process and you will refine your preference to the more specific styles such as Art Deco, Country French, Shabby Chic or Spanish Mediterranean….The styles go on and on and there one’s specifically out there waiting for you! Especially the eclectic one you come up with when you apply this process that combines and mixes your style preference for one all your own.